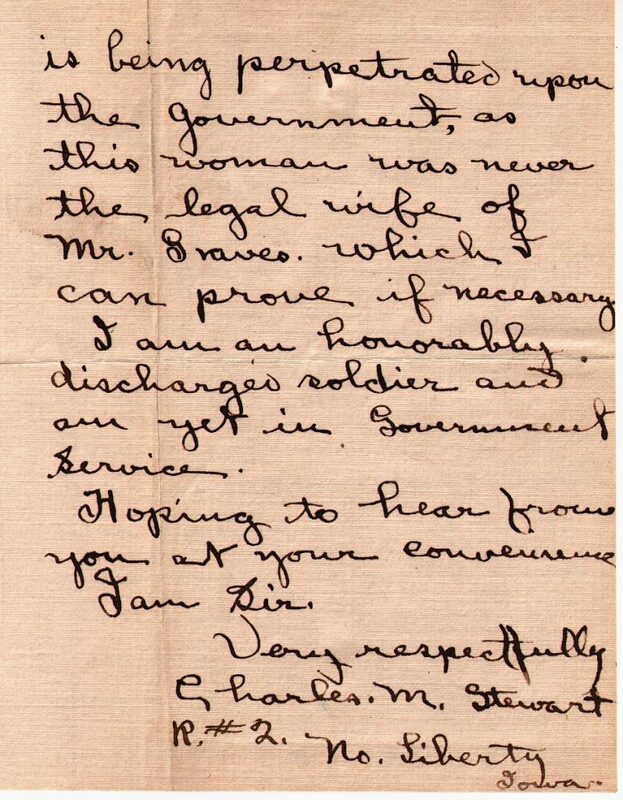 One document rarely tells the entire story and that appears to be the case with this December of 1914 letter written by Charles M. Stewart of North Liberty, Iowa. There is more going on than just what is stated in this one letter from a veteran interested in preventing a fraud that he thought was taking place. 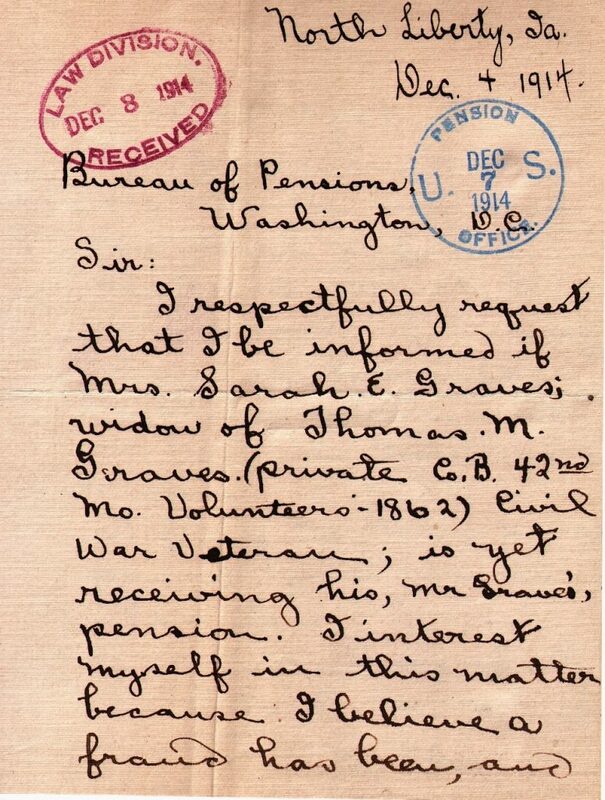 Stewart wrote the Bureau of the Pensions in Washington, DC, to inform them that a “fraud is being perpetrated upon the government.” His concern was that Sarah E. Graves, widow of Thomas M. Graves (private Co. B, 42nd Missouri Volunteers), was receiving a widow’s pension based upon Grave’s service. Stewart does not include any evidence of fraud in his letter, but does state that Sarah Graves “was never the legal wife of Mr. Graves” and that he can “prove [it] if necessary.” How Stewart came to know this, how he knows Graves, or why he’s interested in the case is not stated. Graves was receiving a pension upon his death and spent his post-war life in the Macon County, Missouri, area. It should be noted at this point that Sarah Graves never applied for a Civil War pension. That’s stated in documents signed by officials from the Bureau of the Pensions in this application and there is no correspondence from Sarah Graves in the complete copy of Thomas Graves’ pension application file. But there’s more to this story. The Bureau of Pensions took the letter seriously. They responded to Stewart with a request for more information. Stay tuned. This entry was posted in Uncategorized and tagged Sarah (Newman) Graves pension. Bookmark the permalink.